Sleek and sophisticated, this gold-plated chronograph timepiece with black enamel dial combines simplicity with full functionality ideal for the time-zone-spanning jetsetter. The case is paired with a cool, easily interchangeable mesh strap for a nice masculine finish. 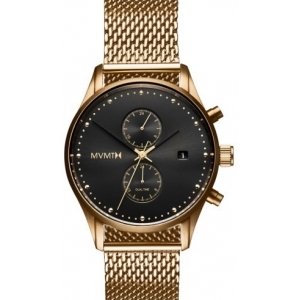 Style Name:Mvmt Voyager Chronograph Mesh Strap Watch, 42Mm. Style Number: 5313961. Available in stores.